I'm thrilled to invite you to the spring Scent Event at Neiman Marcus. There will be a wonderful assortment of fragrances, candles, and other great gifts for Mother's Day. 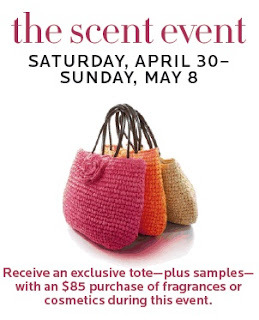 Plus, you'll receive an exclusive tote with fragrance samples when you spend $85 or more on fragrances or cosmetics in stores or online during this event. This offer valid at Neiman Marcus stores April 30-May 8 or NeimanMarcus.com April 29-May 9, 2011. One per customer, while supplies last. Offer not valid on prior purchases and cannot be combined with any other sale, offer, or promotion. With qualifying NeimanMarcus.com purchase, gift will be added at checkout. Offer excludes sales tax, shipping, gift packaging, alterations, NM restaurants, NM beauty salons, NM Gift Cards, catalogs, Bergdorf Goodman, Last Call, Cusp stores, and Cusp.com. Other exclusions may apply; see your sales associate for details. A special thanks to Myra Avear storewide selling specialist for Neiman Marcus! Feel free to contact her for all of your beauty needs in the orlando store: (407)264-5900.